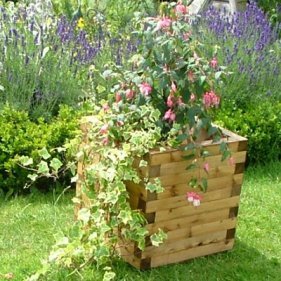 Cube planters are smart modern shaped wooden planters that can be used as a alternative to the traditional Versaille Boxes. Planted with a topiary plant or a more informal display. These wooden planters are made from lengths of 4.5cm x 4.5cm Scandinavian red pine. The bases are slatted with 20mm thick planks to allow for drainage. The whole is treated with a high quality, plant friendly and water repellent preservative which should be renewed every year or so. The internal walls of these planters are now painted with a waterproof paint sealant. Punctuate your garden with planters, using colour and positioning to create interest and add structure to your garden. Or add impact to a planter collection with a single bold splash of colour. You can use accents most effectively to add a bright sparkle to a main colour scheme. For instance, if you decide on cool blue and mauve arrangements for your summer planters a splash of bright orange from a Zinnia would provide the highlight. At other times of year when there are fewer flowers to choose from, and keeping colour in a display is more difficult a dot of an accent colour will add interest to an arrangement of evergreens. planters make an impact ranged in rows or placed in pairs to flank an entrance or similar focal point. However, a single accent planter, carefully positioned, can act as a pivot in any garden design. Try placing a planter centrally at the edge of a patio and plant it to echo a dominant tree or shrub or a colour scheme farther back in the garden. By adding this accent in the foreground you will create interest with alternative horizons and also emphasise your favourite existing features. Planting several matching planters with the same combination of plants and placing them along a path or in disparate areas of the garden will lead the eye from one to the next, highlighting and drawing together the areas you have chosen. lf you have a large garden, an effective way to do this is to use attention grabbing planters that will have instant impact, even at a distance.